Last time, we went six months between updates from Shanghai Disneyland. This time, it's three. So at this rate, you can expect another feature on the newest Disney theme park in half the time of the last one! 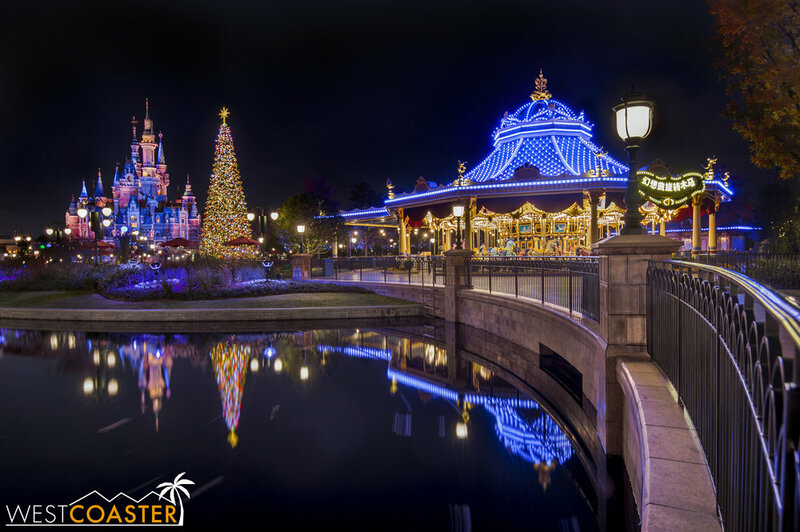 Left to right, the Enchanted Storybook Castle, a towering Christmas tree, and the Fantasia Carousel mark a skyline of sorts in the Gardens of Imagination. Today, we move literally forward from Mickey Avenue into the Gardens of Imagination, Shanghai Disneyland's central hub turned into its full themed land. Visitors of literally any other Magic Kingdom park in the world know that the Disneyland parks have always been organized around a spoke and wheel design, with Main Street leading to a core plaza from which the other themed lands splay out. 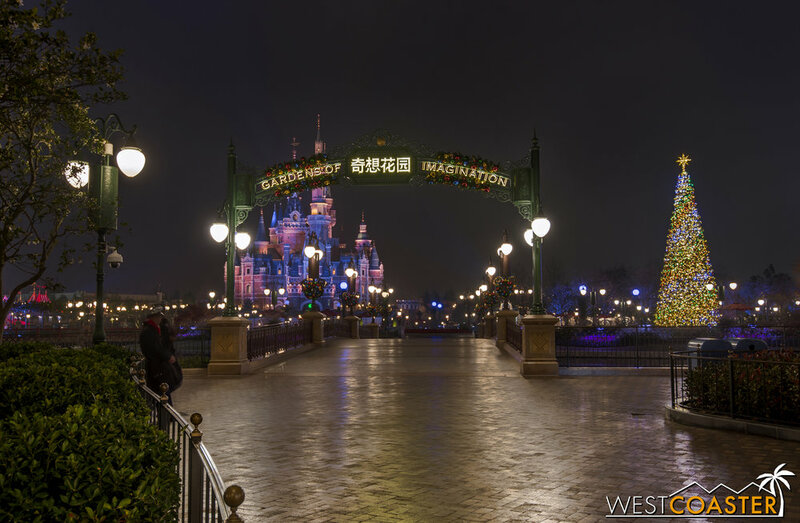 At Shanghai Disneyland, however, this area has been greatly enlarged into its own whole land, with several attractions and a series of gardens, ponds, and gathering areas that also double as a viewing area for castle shows. 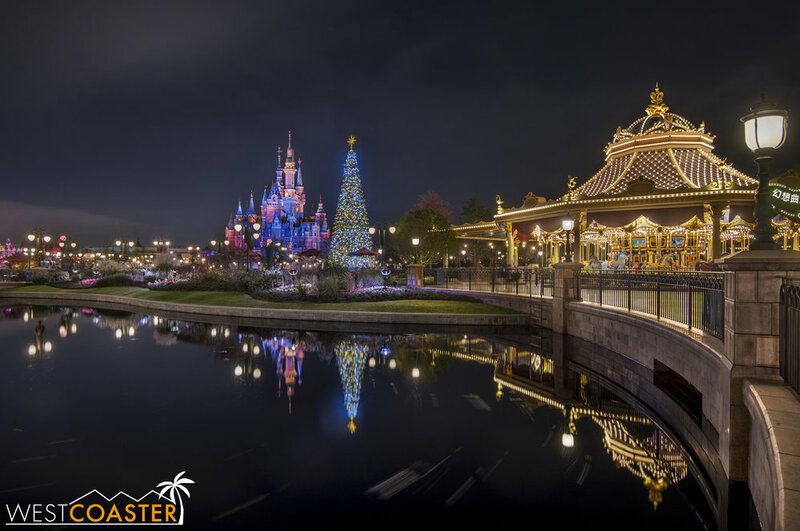 This evolution in the Magic Kingdom park design was made with the anticipation of the crowds that have come to gather for the big nighttime extravaganzas at Disney parks, and as daytime performances in front of the castle have become more popular at places like Walt Disney World and Tokyo Disneyland, the spectator area can serve as additional accommodations for those. 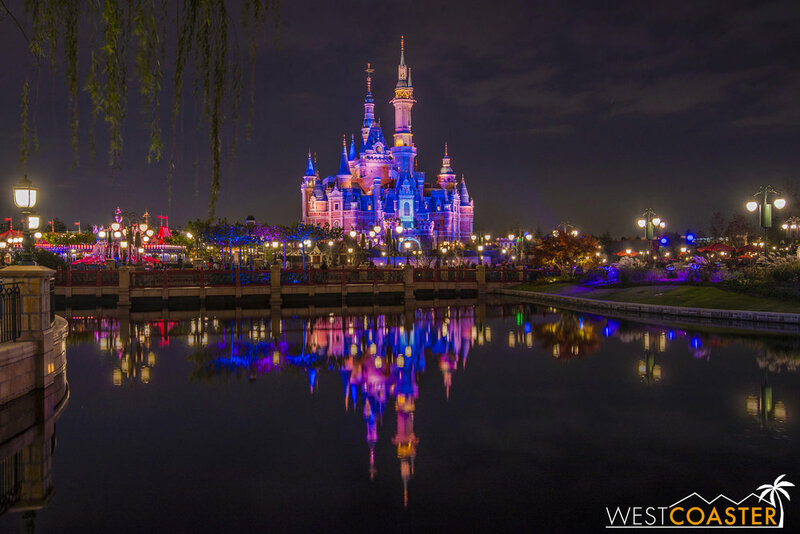 It also hones in on the Chinese people's love of gardens, crafting a Disney-laden version of the peaceful and scenic landscapes that have been prominent in Chinese culture. The Enchanted Storybook Castle reflects off one of many ponds throughout the Gardens. The Gardens of Imagination also served as the other themed land with Christmas decorations when I visited late 2016. 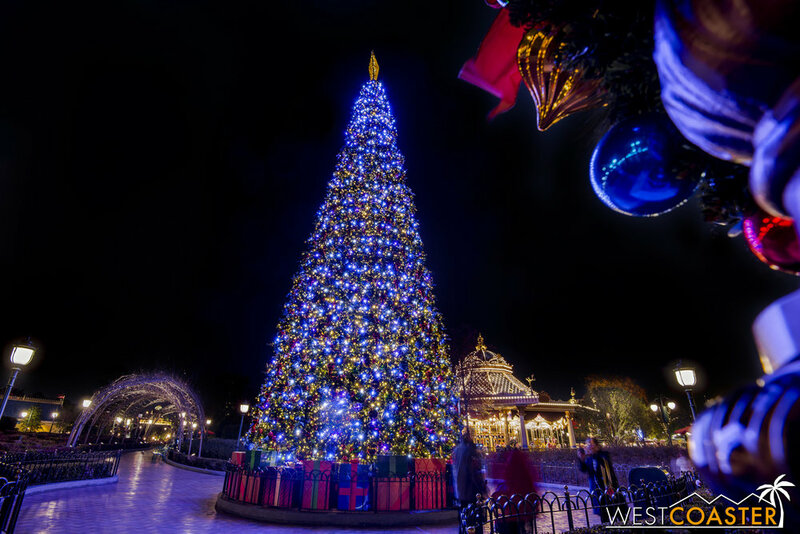 While the holidays are largely lacking in Adventure Isle, Treasure Cove, Fantasyland, and Tomorrowland, they're well represented in Mickey Avenue and here, so you'll see wreaths and ornaments and a towering Christmas tree come December time here in the core of the park! A flower arrangement marks the central axis point of the Gardens of Imagination. A park info stand can be see on the right. Probably the most standout ride in the Gardens of Imagination is the Fantasia Carousel, located on the right side of the area. It relocates the classic carousel-in-the-heart-of-Fantasyland approach and adds something of interest in front of the castle. The design is whimsical, inspired by the imaginations from the classic 1940s Fantasia movie and its late '90s "sequel," Fantasia 2000. 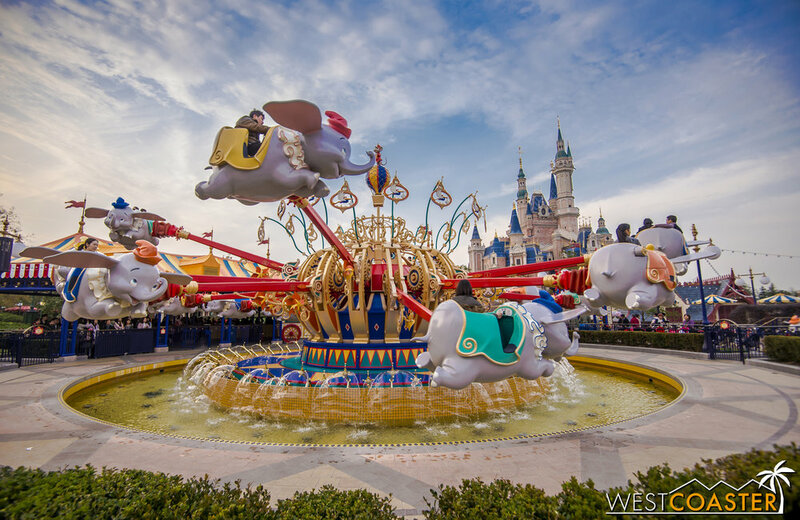 The lovely and whimsical Fantasia Carousel. Pretty by day, the ride really sparkles at night, as its glowing and twinkling lights demonstrate. It's an iconic outline in the Gardens of Imagination "skyline," especially during the holidays! This merry-go-round is dazzling by night. 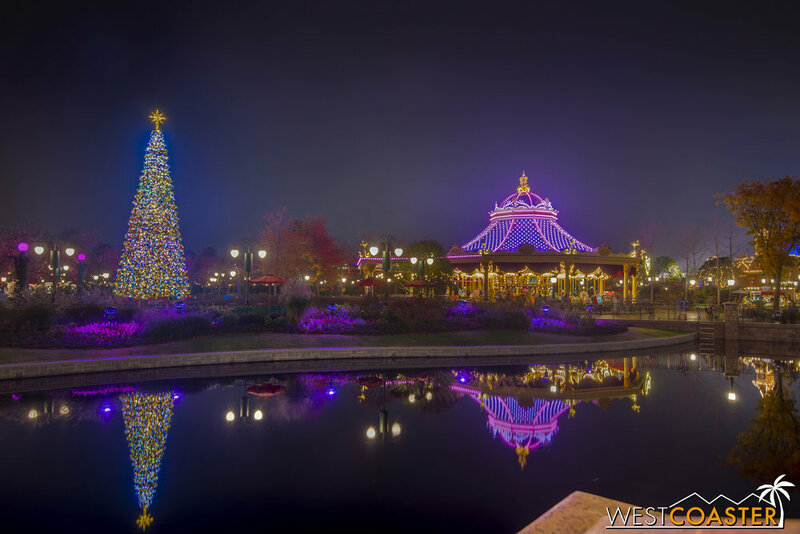 Holiday reflections in the Gardens of Imagination. The other actual ride within the Gardens of Imagination is Dumbo the Flying Elephant, another transplant typically found in Fantasyland. If you can't see a pattern, the Imagineers basically spread the attraction wealth from Fantasyland into its new neighbor, distributing some of the crowds. 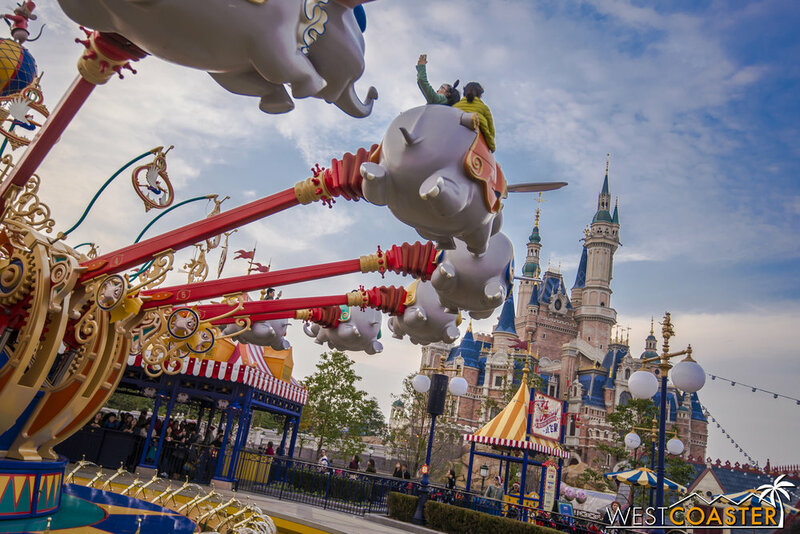 Dumbo is the same type of spinning ride that is found in any Magic Kingdom Park, and it is located in front of and to the left of the Enchanted Storybook Castle, Shanghai Disneyland's central park icon. 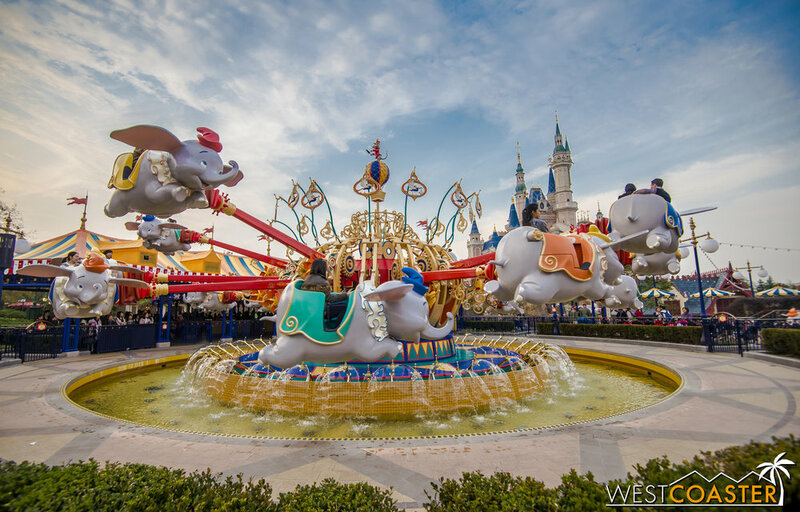 Popular favorite Dumbo the Flying Elephant is in the Gardens of Imagination at Shanghai Disneyland. Yes, outside the castle boundaries, rather than within Fantasyland. It offers the same thrill of flight to children as its international brethren. And it occupies a photogenic spot beside the Enchanted Storybook Castle! The remainder of the attractions at the Garden of Imagination are more interactive meet-and-greets or photo ops as opposed to dynamic attractions. Just next to Dumbo the Flying Elephant, guests can Meet Mickey after wandering through his enchanted gallery. It's similar to Mickey's House in the Toontown areas at Disneyland and Tokyo Disneyland (for those familiar)--basically a themed environment in which to grab a photo with the boss mouse himself! Just beyond is the Marvel Universe, a hybrid of Disney California's Art of Animation Academy and the old Marvel exhibitions at the Tomorrowland Expo Center. Guests can Become Iron Man by suiting up in virtual Iron Man gear, or meet Spider-Man on a rooftop set, or take a picture with Captain America. There's also the Marvel Comic Academy, where guests can learn to draw their favorite Marvel superheroes. 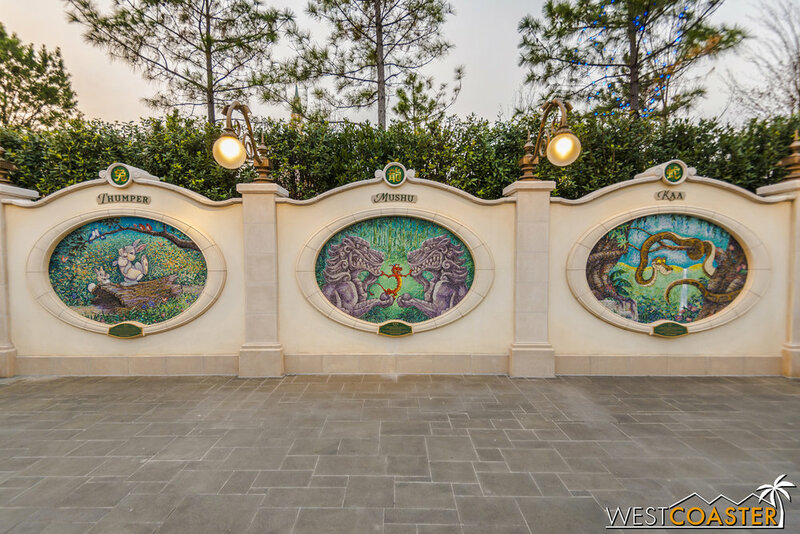 Across the way on the right side of the Gardens of Imagination, behind the Fantasia Carousel, Garden of the Twelve Friends is a series of adorable mosaics that provide a backdrop for guest photos. 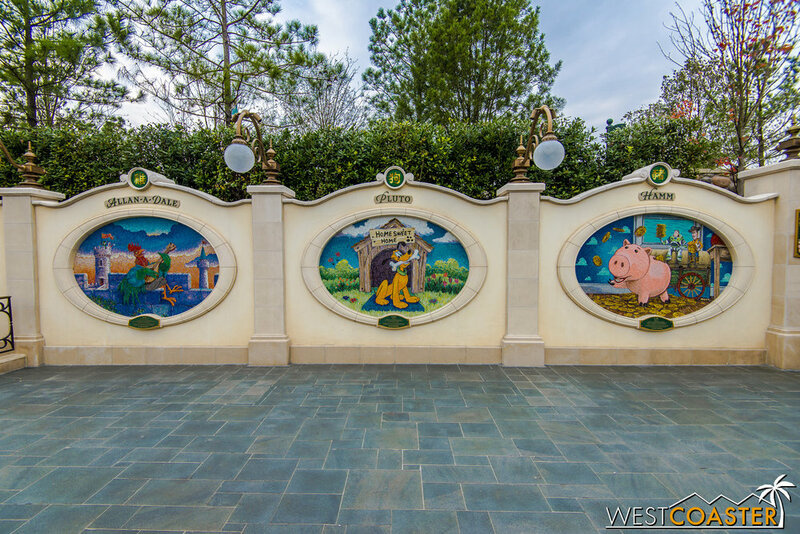 Utilizing various Disney characters to represent the twelve animals of the Chinese zodiac, these tile artworks are quite charming, pulling from both famous and lesser known characters from past Disney productions, ranging from Tigger, Remy, and Hamm to Babe the Blue Ox, the Jolly Holiday Lambs, and Allan-A-Dale. The first three signs of the Chinese zodiac, a rat, an ox, and a tiger. A rabbit, dragon, and snake form the next three. The horse, the sheep, and the monkey kick off the back half of the Chinese zodiac. The chicken, the dog, and the pig form the final trio. In front of the Gardens of Imagination, where the land meets the end of Mickey's Avenue, Storytellers Statue provides the Walt and Mickey iconography for Shanghai Disneyland. Situated almost inline with the Enchanted Storybook Castle, it is a great photo spot at the end of the night, especially as security quickly pushes guests out to the end of Mickey Avenue after the closing Ignite the Night castle show. Frequent visitors of Disney California Adventure may find this statue familiar at Shanghai Disneyland. Just to the left of Storytellers is the Melody Garden, a small plaza area with whimsical sights and sounds. It's a small waterfront area, used more for "impromptu" performances and more fantastical fun. Finally, Golden Fairytale Fanfare is the park's daytime castle show. It is an elaborate theatrical production of song and dance that recounts the stories of Snow White, Anna and Elsa, Jasmine, Ariel, and Merida. This makes sense, given the fact that the Enchanted Storybook Castle is the first Disney castle dedicated to all the princesses, not just a particular leading lady. And of course, Mickey and Minnie join in the festivities at the end of the show. The stage area for the Golden Fairytale Fanfare. The show was not operating during my visit in late 2016. The Wandering Moon Teahouse is the star dining establishment in the Gardens of Imagination. This restaurant, themed a bit to Mulan and serving traditional Chinese regional dishes, looks as fancy and elaborate as a formal sit-down restaurant, but it's actually a quick serve! The restaurant is a tranquil and beautiful respite from the bustling park, and it features some of the best food in the park. Among the restaurants in Shanghai Disneyland, this definitely falls on the can't miss category. It's just a lovely and soothing space, both outside and in, and it has great, gourmet cuisine! The Wandering Moon Teahouse is a fantastically themed and exceedingly serene space. Within these walls, there are various rooms in the style of a different Chinese region or time period. It is perhaps the most overt example of Shanghai Disneyland's "authentically Disney, distinctly Chinese" tagline. The rest of the Gardens of Imagination has a series of food carts serving various portable snacks. Timothy's Treats, by Dumbo, has hot dogs for sale. Picnic Basket, at the end of the Garden of the Twelve friends and across from the Wandering Moon Teahouse, has smoked duck leg and pineapple puff. The Outdoor Wandering Moon Tea Cart also has snack items of the Chinese cuisine variety. Finally, there's also an Outdoor Churros Cart and an Outdoor Popcorn Cart, selling exactly what you'd expect. There are three retail spots in the Gardens of Imagination. Marvel Mementos is located just outside the Marvel Universe attraction, selling expected souvenirs from Iron Man, Spiderman, Captain America, and the gang. Casey Jr. Trinket Train is located next to Dumbo. 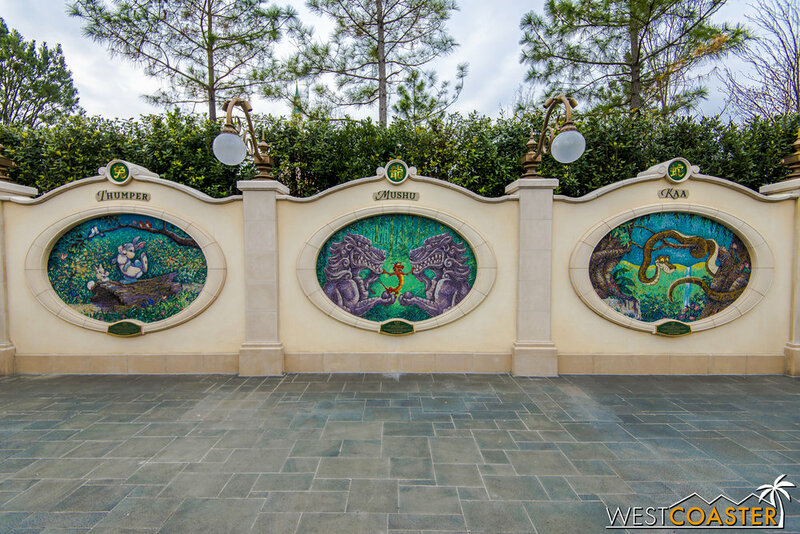 Lastly, Scuttle's Shiny Things is located on the far right edge of the land next to a pathway into Teasure Cove. The last two are little souvenir stands that sell plush toys and other apparel and accessories. Casey Jr.'s Trinket Train can be found on the Dumbo side of the Gardens of Imagination. As you can see, the Gardens of Imagination is a unique land among all the Disney parks. It's both designed for circulation, orientation, relaxation, and recreation. It celebrates the Chinese cultivated garden culture, with its verdant landscaping and peaceful ponds and little areas of contemplation, but also sprinkles just enough attractions to classify it as a land in and of itself. And with the Enchanted Storybook Castle as a focal point, it's also quite a photogenic place for those looking to capture pictorial mementos! 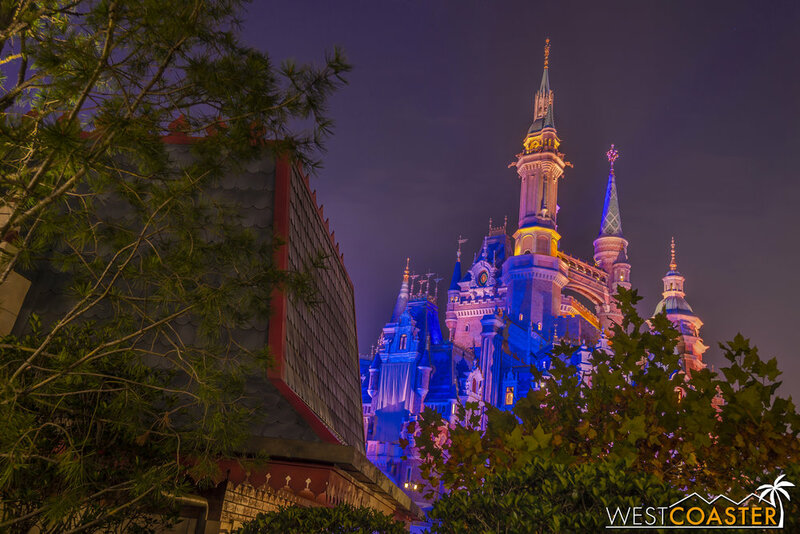 The Enchanted Storybook Castle makes a beautiful backdrop from any angle. This concludes our little sojourn around the Garden of Imagination. Next time, tune in as we begin our arc around the more substantive themed lands that surround the Gardens, starting with Adventure Isle!